A day after Ibrahim Magu's confirmation as EFCC chairman was rejected for the second time by the Senate, the presidency has kept mum. The Senate has requested that President Muhammadu Buhari nominate a replacement for the Acting Chairman, Economic and Financial Crimes Commission, Mr. Ibrahim Magu, following the rejection of his nomination by the legislature on Wednesday. The upper chamber of the National Assembly said the rejection had ended Magu’s chairmanship of the EFCC in acting capacity. The decision was based on a security report on Magu by the Department of State Services. Magu, however, denied the allegations against him in the report, saying the DSS never invited him to defend himself, urging the lawmakers to disregard the report. After all questions had been asked, President of the Senate, Senator Bukola Saraki, who presided over the plenary, asked the Clerk to the Senate to confirm how many letters were received from the DSS. There were reports that the DSS issued two conflicting reports on Magu; one was addressed to the Clerk of the Senate, while the other was sent through the Senior Special Assistant to the President on National Assembly Matters (Senate), Senator Ita Enang, who had refused to comment on the second letter when he was asked by journalists. The Senate President, thereafter, put Magu’s nomination to voice vote and the nays had it. Angered by the rejection, former Majority Leader of the Senate, Senator Ali Ndume, raised a point of order, in which he accused the Senate of double standard. He said, “Yesterday, we got a letter from Nigeria Customs Service, signed by an Assistant Comptroller General (and sent) to the Clerk. We said that was not the right thing to do. Saraki, however, ruled Ndume out of order. The Presidency, however, refused to state the next step it would take as a result of Magu’s rejection. Although the Senate did not screen Magu in the first attempt to confirm his nomination on January 25, 2017, the lawmakers had stopped the process based on the DSS report on him, which it said was negative. 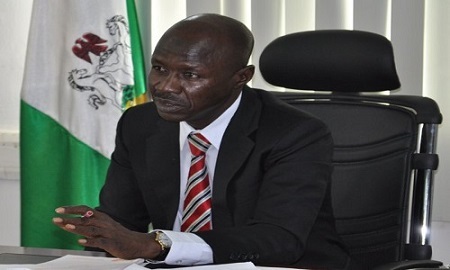 Among others, the DSS in the first letter, accused Magu of breaching the EFCC protocol by being in possession of the EFCC documents in his private residence during the chairmanship of Farida Waziri. The DSS also cited his arrest, detention and suspension by the Nigeria Police. It also made a reference to Magu’s lifestyle, alleging that an individual paid N40m for the EFCC’s boss residence in Abuja. The Senate, after rejecting Magu’s nomination in January, had communicated the rejection to the President. But Buhari, in his response to the Senate, said the issues raised on Magu had been clarified and urged the lawmakers to confirm him as Chairman of the EFCC. Consequently, the Senate discreetly wrote the DSS on March 7, 2017, asking for a new report on Magu. The DSS replied the Senate on Tuesday, insisting on its earlier report on Magu. The new letter read, “Your letter, NASS/CS/SA/01/17/08/02, dated 7th March, 2017, requesting security report on the above named nominee, refers. The letter was signed by one F. O. Adams on behalf of the Director-General, DSS. The lawmakers, who drilled Magu for about two hours during the confirmation hearing for his appointment on Wednesday, insisted that the issues raised by the DSS could not be ignored. Senator Dino Melaye, after several lawmakers had asked various questions to which Magu responded, recalled that there were two letters from the DSS, which had placed a moral burden on the EFCC boss. “I conclude that there is a case right now in the police station, which you are aware of, where EFCC people raided a particular house and C of Os were taken and those C of Os were found in the market; and police have investigated and two of the C of Os have been returned to the owner. Magu, in his response, dismissed the DSS reports. He also said he knew Mohammed only when both of them were appointed as members of a presidential committee which probed the Nigerian military. He said, “This paper (report he was holding) is the same paper (Melaye read). I have read it. There were two reports of such submitted to this office the same day and there were two of such reports submitted by the same law enforcement agency; two different reports submitted the same day about the same people. That goes to tell you the credibility of such an institution. “I have respect for everybody in this hall (chamber) and I have senior brothers in this hall. Elder Gemade, please, what does it mean if an institution can submit two varying reports on the same person on the same day. Dino is my friend and we were fighting corruption together until he came to this house here and abandoned us. I have to be open. “On the case with the stolen C of Os, it is not everything that is done in the EFCC that I have knowledge of. The EFCC is too big. Believe you me, if not now, I didn’t know there was a case pending against EFCC staff in police station. I will now go back and investigate it and give you feedback after my investigation. Meanwhile, the national leadership of the Peoples Democratic Party said the Senate had the right to either reject or accept the nomination of Magu as the chairman of the EFCC. Acting National Publicity Secretary of the party, Mr. Bernard Mikko, stated the party’s position in an interview with our correspondent. Mikko, a former member of the House of Representatives, said, “It is the right of the senators to either reject or accept Magu, but we need to fight corruption in this country. Corruption is the major problem of Nigeria. But the National Publicity Secretary of the All Progressives Congress, Mallam Bolaji Abdulllahi, said Magu’s confirmation was not a matter for the party. “Magu’s confirmation is not a matter for the party. We don’t want to politicise a routine administrative and constitutional process. “However, we are confident that Mr. President’s commitment to fight corruption will proceed earnestly, regardless of who eventually gets appointed as the head of any of the anti-corruption agencies,” the APC spokesman added. Also, the Chairman, Presidential Advisory Committee Against Corruption, Prof. Itse Sagay, slammed the Senate for refusing to confirm the appointment of Magu. Sagay, a Senior Advocate of Nigeria, added that Magu could continue to head the EFCC despite being rejected twice by the Senate. He said this during an interview with one of our correspondents on Wednesday. He added, “Members of the Senate know that Magu is an upright man, a man of integrity. They know he is fit for the job to fight corruption. Therefore the Senate’s decision to do what is wrong is for reasons which we do not need to guess. “It is a perverse decision, they have done their worst but the only consequence is that Magu will continue to be acting chairman instead of substantive chairman but his power will remain intact. But human rights lawyer, Mr. Mike Ozekhome (SAN), argued that it would be morally inexplicable for Buhari to nominate Magu as the acting Chairman of the EFCC for a third time after being rejected by the Senate twice. Ozekhome said this in a statement titled, ‘‘The legal and moral issues of the second and final rejection of confirmation of Magu as EFCC chairman’’. The senior advocate said, “Re-presenting his (Magu’s) name will raise more questions than answers as to why the insistence on one man. This is unlike the first instance when the Senate merely turned him down without any screening. “That it was done shortly after the celebrated arrival of President Buhari from his medical vacation makes it more interesting and more significant as it underlines the independence of the legislature, the Senate. On his part, the Chairman of the Coalition Against Corrupt Leaders, Mr. Debo Adeniran, condemned the Senate’s fresh rejection of Magu. Adeniran stated, “The Senate President, Bukola Saraki, has also not demonstrated the capacity to defend the allegations of corruption and anticipatory declaration of assets for which he is being prosecuted and other sundry allegations that are still hanging like the sword of Damocles on his neck. “The senate seems to be working in connivance with the Department of State Services.